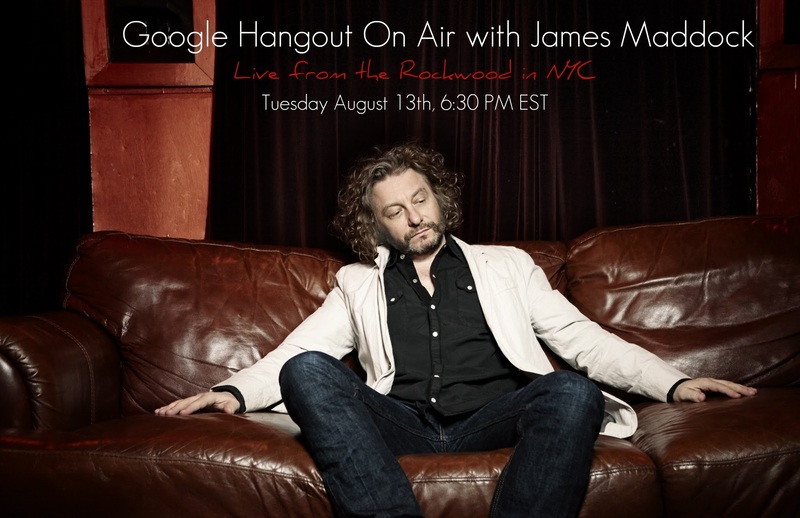 COME HANG WITH JAMES MADDOCK IN HIS FIRST EVER GOOGLE HANGOUT ON AIR, LIVE FROM THE ROCKWOOD IN NYC ON AUGUST 13TH! ALL OF THE INFO HERE! Come hang with James Maddock in his first ever Google Hangout On Air, live from the Rockwood Music Hall in NYC on August 13th! You can also submit your questions on James's official Facebook page and by mentioning him in a tweet on Twitter: @jamesmaddock. Include the hashtag #JamesMaddockHOA, that way we can keep track of all the buzz surrounding the hangout. After submitting your questions, report back to James's Google+ page at 6:30 EST on August 13th to live stream the hangout, listen to a few new songs, and see if your question is answered. The hangout will then be archived and available to watch on James's YouTube page. Spread the news, invite your friends, and we'll see you on the 13th! UPDATE: Thanks to everyone who watched the first Hangout On Air and submitted questions! The video of the broadcast is now available on James's YouTube channel -- we've also embedded it for you below. Enjoy!